There are many ways to spruce up your room to look like a place from Middle Earth, and here’s another one: paint your walls with ivy to look a bit more Elvish. – Get a good idea about where you want your paintings to be. I suggest over headboards and above windows and/or doors. – Once you decide where the paintings should go, use of the painter’s tape and affix the stencils to the wall. This keeps the stencils from moving when you go to paint over them. – After stencils are in place, dip the stencil brush into a little acrylic paint. Don’t use too much, or it will smear. Tap brush lightly on a paper towel or piece of cardboard before stencilling. – Now it’s time to stencil! There’s a specific way to apply the paint over the stencil. Do not use regular brush strokes! If you do it this way, the paint will be pushed under the stencils and ruin the painting. You must gently dab the stencil brush up and down, using a stabbing motion so the flat of the brush delivers the paint to the surface. – Repeat until you have the ivy painted everywhere you want it. – Let paint dry for about 1-2 hours. – When paint is dry, you can come back and add a little detail to the ivy. Use a lighter color to paint in the veins of the ivy with a regular paint brush. 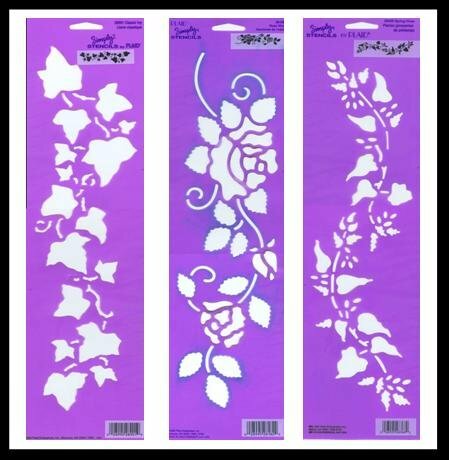 If your stencils did not include the vines of the ivy, you can paint those in free-handed. You can also add any other kind of painting to your design. Be creative! – Let that dry for about 1-2 hours as well. That’s it! You’re finished! Now your room looks even more delicate with this beautiful, Elven ivy! I put this right round my ceiling and my paintings and my mirror and my bed!